Jed O'Brien hit an unbeaten 39 during Hastings Priory's defeat away to Horsham. Hastings Priory Cricket Club’s first team was beaten by a Horsham side containing three Sussex squad members. Priory lost by six wickets away to a team boasting the talents of Tom Haines, Will Beer and George Garton in the Sussex League Premier Division on Saturday. Priory were all out for 141 in 42.5 overs after winning the toss and choosing to bat - the seventh time they’ve been dismissed for less than 150 in the league this season. The visitors were grateful to a season’s best 39 not out from 33 balls by number eight Jed O’Brien for earning them a couple of batting points after losing four wickets for one run at one stage. After Tom Gillespie was bowled by Garton for a run-a-ball 11 with the score 14, Joe Billings and Ryan Hoadley added 40 for the second wicket until Billings was caught by Beer off Haines for 21. Hoadley was caught by Haines off Joe Ashmore for 27 to leave Priory 61-3. Priory then lost two wickets with the score 79 - Elliot Hooper for nine and Jake Woolley for eight - and two more with the score 80 - Greg Devlin for a 15-ball duck and Harry Scowen for one off 18 balls as Beer and fellow spinner Ashmore worked their way through the order. O’Brien counter-attacked, though, and took the total into three figures before Adam Barton was eighth man out, caught by Haines off Beer for three. Priory were 120-9 after Beeslee was caught by Haines off Ashmore for five. The last wicket pair put on 121 until Adam Pye was caught by Mika Ekstrom for 10 to complete Ashmore’s five-wicket haul. O’Brien, unbeaten at the other end, struck eight boundaries. 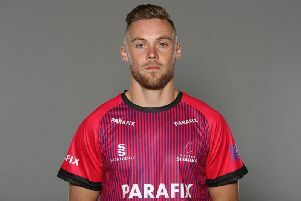 Ashmore finished with season’s best figures of 5-34 (identical to his best analysis last summer when playing for Bognor Regis) from 11.5 overs, Beer took 3-28 from nine, Haines 1-14 from seven and Garton 1-19 from seven. Horsham proceeded to reach their target in 25 overs for the loss of four wickets, three of which were claimed by spinner Beeslee. The hosts made their way to 89 before losing both openers on the same score. Craig Gallagher was firstly caught behind by Billings off Beeslee for 40 off 37 balls and then Tom Clark was caught by Pye off Hooper for 44 from 32 deliveries. Haines and Michael Thornely put on 42 for the third wicket until Horsham again lost two wickets on the same score. Haines, who scored a century in the reverse fixture and has a County Championship to his name this summer, was caught by Pye off Beeslee for 26 before the same bowler had Nick Oxley caught behind for a second ball duck. Thornely (24 not out) and Beer (3 not out) knocked off the remaining runs. Beeslee finished with 3-48 from nine overs and Hooper 1-30 from seven.